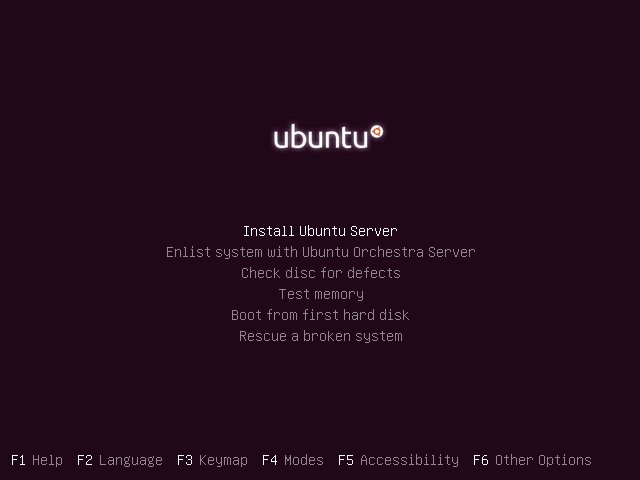 To start go to http://www.ubuntu.com/download/server/download and get the ISO image of ubuntu server 11.10 (64bit or 32bit depending on the architecture of your machine) then either burn the ISO on an empty disk or create a bootable USB Flash drive, using either Linux Live USB creator or any other piece of software of your choice, if your system supports booting from a flash drive. As soon as you boot from the media you will come across the language selection screen, select English and continue. At the next screens you will once again get asked to select a language, choose English. In the Select your Location screen you select the location of your server, this has to do with the time zone. If you get asked to Configure Locales choose United States – en_US.UTF8 and continue. At the Configure the Keyboard screen select NO and in the Country origin of the Keyboard list go and select English (US). Next in the Keyboard Layout select once again English(US). Next in our installation is the network configuration. 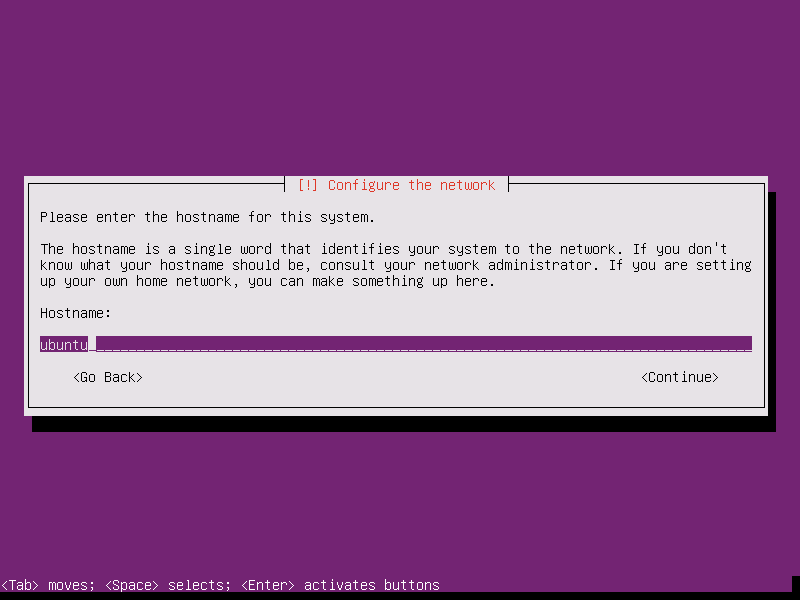 You will be asked to enter a hostname for the system, you can add a name for the system depending on your network. Next there will be the Configure the clock screen. You just have to confirm your timezone (It should be the correct since you choose the country previously). Now we have to partition our disk(s). We will select the manual partitioning. If you get a message saying You have selected an entire device to partition…. select Yes. This will be probably be the same for every drive. If the drive already has partitions you will have to remove them before proceeding. At some point you should see under the first drive some text saying pri/log DrivesSpace GB FREE SPACE go there and press Enter. On the Partition disks screen select Create a new partition and press enter. Then you should get across the following: Select the Use as: line, press enter and Select on the menu the Ext4 journaling filesystem, on the Mount Point select /boot and set the bootable flag to on. Then go to Done Setting up the partition to finish with the boot partition. After finishing with the /boot partition there should be a line under the first drive looking like this #1 primary 600.0 MB f ext4 /boot and the line containing the word FREE SPACE should be right under this. You also have to create Empty Partitions for every single drive you want to use for the Volume Group. At this point you should go to the option saying Configure the Logical Volume Manager. In the screen with the Summary of current LVM configuration all the values should be zero. On the LVM configuration action: you should create the Create volume group. Give a name to the volume group, something like server_vg. When you get asked to select the devices for the new volume group. Select the other drives along with the empty space in the first drive. After selecting the drives you can continue. the new volume group should contain all your drives. Write the changes and continue. At this point the summary of the LVM configuration should have 3 Used physical volumes and one Volume Group. The next step is to create logical volumes inside the server_vg or whatever is the name you choose. Select Create logical volume, then select the volume group. At this point you will get asked for the name of the Logical volume, generally I use as a name for each volume the name of the Mount point that will used for the volume. The first logical volume will be used for the swap partition. So I will name it swap. When asked for the Logical Volume size use 1.5 times the amount of the server’s RAM. Then you have to create Logical volumes for at least root(/) and (/home), I used about 10GB for the root logical volume of my server and the rest for /home. I also used a separate logical volume for /var, to keep it separate from the root partition, because there resides the web root folder, along with my git repositories etc. For the /var partition I used 20GB. So we have the following: swap – 1.5*RAM, root – 10GB, var – 20GB and home – the rest of the available space. 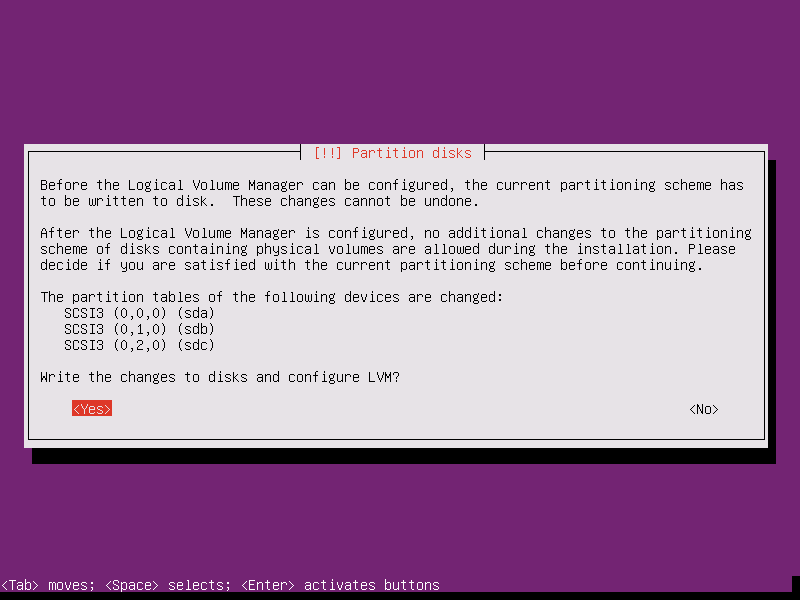 At the end of the creation of the logical volumes if you choose Display configuration details as an LVM configuration action you should get a screen that looks like the following. At this point select Finish, that should take you back to the overview of partitions and mount points. There you should now see the Logical Volumes above the physical ones. 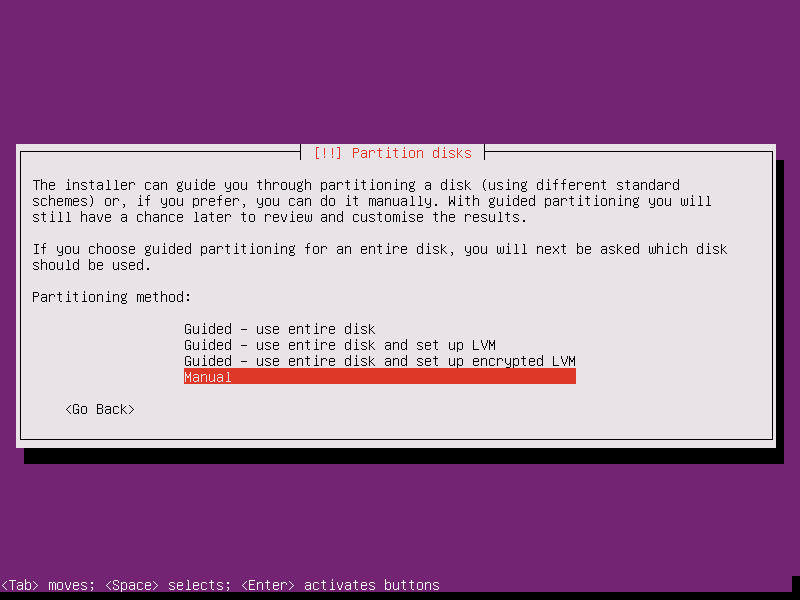 At this point we have to format the partitions – logical volumes and assign mount points like we did with the boot partition. To do so go to the numbered entry underneath each volume and press enter. At the Use as: you have to select Ext4 Journaling file system for every single partition except the Swap (for swap it should be swap area). Remember we have named each logical volume after the mount point it is going to host. So it will be easy to select mount points for each volume. /home is for the home volume, / is for the root one, /var for the var. After finishing with the setting for each partition you should select Done setting up the partition to return to the overview. When you are done with every single partition select Finish partitioning and write changes to disk, to continue. You will then be asked to write the changes to disk, select Yes and continue. At this point the installation of the base system will start. When that finishes you will asked to create a new user. First you will be asked for the Fullname, then the username, then the password (twice). You will also be asked if you want to encrypt you home directory, that’s up to you, I usually leave it unencrypted. Then it is the proxy configuration, probably you will have to leave it blank and continue. After a while you will get asked how you want to manage upgrades on the system. I usually prefer to do the updates on my own, so I prefer No automatic updates. Then will be prompted to select software to be installed, installed, ignore every single option and continue we will install everything needed on our own. When you get prompted for the GRUB installation select Yes, to install the boot loader to the Master Boot Record. At this point you should get an Installation complete message. Remove the installation media and press Continue. The system should reboot at this point. After the boot process is finished you will be presented with the login prompt, use your username and password to login. At this point you should first do the following to update the installation to the latest packages. At this point we are going to install the OpenSSH Server in order to have shell access to our server. After the installation of the OpenSSH server we have to edit the ssh daemon’s configuration file and change the Port from 22 (the default ssh port) to some other port of our selection. This is done for security reasons. This way you will avoid lot’s of automated brute force attacks that target the default ssh port. Now it’s time to restart the sshd to do so. At this point you should be able to connect to the server from another machine using an ssh client (on windows I prefer using Putty). During the installation you will be asked to provide the password for the root user of the database. This password is the administrative password for the MySQL database. You will need it for the administration of the MySQL installation, like creating new users/tables editing privileges etc. After this we are gonna install phpMyAdmin for the easy management of the database. At some point during the installation you will get asked for the automatic configuration of phpMyAdmin. During this you will have to use the MySQL root (administrative user) password to allow the installer to configure automatically phpMyAdmin. After this you will also get asked for a password for the phpMyAdmin administrative user. If you use a dynamic dns service like DynDNS or no-ip, with the free service you can get up to two different hostnames per account. Since gitorious needs its own hostname you can use own for gitorious and the second one for a normal site that will also host redmine as a sub-uri and phpmyadmin etc. If you use a router with DD-WRT or running INADYN on the server it self you can configure it to update the two hostnames to your connection’s IP. To do so in DD-WRT you have to go to Setup then DDNS there add you username – password and in the Host Name field add the following “hostname1 – a hostname2“, now DD-WRT should update both the hostnames with your IP every time it changes. With the usage of the virtual hosts in apache you you can now use the hostname1 for redmine, phpmyadmin, and the website and hostname2 for gitorious. After this we are gonna install the MySQL client along with the development libraries. We are gonna need these for the Gitorious installation later. All the following packages are gonna be needed at some point during the Gitorious installations so we are gonna install them all before starting the installation. Afterwards we will install memcached and add it to the default running services of our server. At this point we have to get and install the Ruby Enterprise Edition (REE). Before we start with the installation we are going to create a folder inside our home folder. There we are going to download and unzip all the resources need in this guide. Since we are already inside the temporary directory now we can go to the website of REE and get the latest version. At the point of this installation the latest edition was v1.8.7-2011.03. To download REE we have to go to the terminal, and download the latest version (get the URL from the download site) using wget. In case you downloaded a different, newer version just replace the filename with that of the one you downloaded. Afterwards we have also to prepend the following to the /etc/ld/so.conf file. At this point we are going to get and install Ruby gems. For this we will use again the temporary directory we created before. After this we are gonna install the sphinx search server. If you check the website, the recommended version is the Beta of v2.0 or generally some newer version, but we are gonna use version 0.9.9 because that’s the one used in every guide, and it seems to be working fine. (To be honest I didn’t test the system using a newer version so I have no idea if it is working or not). (before downloading the file change in the tmp folder cd ~/tmp). If you check the various guides on the net you will find out that many use as an alternative the stompserver. In our case we will use the Apache ActiveMQ as the messaging system. And finally add it to to the services with default priority so it starts when the machine starts. At this point we will clone the gitorious repository to the folder we previously created. Then we have to give the ownership of the gitorious folder to the git user and then change the rights to the directory. In the file search for the line that starts with RUBY_HOME= and change it’s existing value, if it has one with the your ruby installation path. If you installed ruby enterprise edition as suggested, from the .deb package then it is probably in /usr/local. You have to do the same for the git-poller script, it is in the same directory as the git-daemon. Next we have to make the scripts executable. And then we have to add them to the services with default priority. Afterwards we have to create the directories that will host the git repositories along with the tarballs for gitorious and give the ownership to git (user/group). Then we have to prepare the server for the SSH authentication. To do so we have to get logged in as the git user. Next we have to configure Gitorious itself. I supposed you are still logged as the git user, if not do so (sudo su git). Go in the Gitorious home directory (cd ~/) and copy the sample configuration files to create the new configurations files. The next step will be to edit the config/gitorious.yml file, but before doing so we have to use apg -m 64 on the terminal in order to create the cookie secret code. Copy the generated code to some text editor and remove the newlines, so it will be a single line string. Now we can proceed with the file editing. To so use nano config/gitorious.yml (Remember you should be logged as git and in the user’s home directory). Once inside the gitorioys.yml configuration file, you have to search for the line that starts with the production: string. This is the section of the configuration file that interests us. Note: The repository paths should be in /var/git we created previously so there will be no need to edit it in the configuration file, unless you decided to change the path. In cookie_secret: you will have to paste the output of the apg -m 64 command you kept in the text editor previously. Next you have to go to the is_gitorious_dot_org: false line. Uncomment it and make sure it is false. Also if you don’t want your repositories to be available to public you have to uncomment the public_mode: false, if it is not false you will have to make it. You can also search through the configuration file and find if you want to change any other options, they are pretty much well commented so you will have no trouble figuring out what each one does. You can also remove or comment the whole test: section. The next step will be the to create and migrate the database. Before we do anything at all we have to create the gitorious user and the related table in our database. Most people prefer to do so through the terminal in their guides, if you want to do so you can follow one of the links in the end to find how to do so, if you don’t already know. My own approach will be using phpMyAdmin. Go to the phpMyAdmin page (it should be something like hostname/phpmyadmin or serverip/phpmyadmin). Log in and then go to the tab Priviledges. Once in there click on the Add new User option. In the field User Name: you should put gitorious, in the Host: field you have to select localhost and generate a random password. Keep the generated password noted somewhere because we are going to need it in the database.yml configuration file. Then find the Database for user section and select Create database with same name and grant all privileges. Finally click on the create user button to create our new database user. Then we have to create the administrative user for gitorious. In the default.base search for the searchhd text and replace the word address with listen. After this the bootstrap command should run without issues. Then we have to change the rights for a few folders and files (some of the folders there should already have the proper rights). Keep it noted for a moment because we will need it for the passenger module configuration files. Note: the paths or the versions may differ so adjust accordingly. Also at this point we will also install the xsendfile mod for apache. Check the xsendfile mod version and keep it noted for the virtual host configuration. and then restart apache sudo /etc/init.d/apache restart. Then we have to append the following to ~/.bashrc as the git user (sudo su git). If the version of xsendfile mod is <0.10 you have to use the following instead in the IfModule mod_xsendfile.c tags. Now we can activate the the gitorious site with the command a2ensite gitorious. After saving the file you can activate the gitorious ssl site by typing a2ensite gitorious-ssl then you have to restart apache in order to load the new configuration with /etc/init.d/apache2 restart. Then you can reload the SSH configuration with sudo /etc/init.d/ssh reload. Now the git user should be accessible only by using public-private key combinations. Previously in the guide we created a tmp folder in the home folder, if you kept the directory change in it cd ~/tmp (if you deleted or just started the guide from this point you can create it before changing in it by mkdir ~/tmp). After changing in the tmp folder you can open your browser and go to RubyForge to find the link to the latest version of redmine. In my case the latest version was the 1.2.1. Copy the link location and then go to the terminal type the wget command and paste it after the command. After downloading the file un-tar it and go in the redmine folder. At this point we have to create the redmine user in the database. In the field User Name: you should put redmine, in the Host: field you have to select localhost and generate a random password. Keep the generated password noted somewhere because we are going to need it. Then find the Database for user section and select Create database with same name and grant all privileges. Finally click on the create user button to create our new database user. Then we have to copy the example configuration file in order to create the database.yml file. sudo cp -r ~/tmp/redmine-1.2.1 . Then get inside the new redmine directory it should be /opt/redmine/redmine-1.2.1 and run the following to generate the session store, migrate the database and load the default data. During the default data loading if you get asked for a language, accept the default language (English). Then we have to change ownership on a few folders in the redmine folder, and change the rights on a few more. The passenger module should already be loaded since we installed Gitorious previously. Now we have to configure the virtual host for redmine. I have to note at this point that Redmine will be configured in the hostname with the phpmyadmin etc. you have to edit the ports.conf file, sudo nano /etc/apache2/ports.conf, go inside the <IfModule mod_ssl.c>tags and add NameVirtualHost *:443 above the Listen 443 line, then save the file.